I first came out of hospital in 2001. A nurse at the hospital told me about a man who was a learner with Lead Scotland. I contacted him and he put me in touch with a learning co-ordinator with Lead Scotland based in Elgin in 2003. I got support and started off with working through computer basics and then went on to do ECDL. A number of years later in 2012 my Key Worker from Moray Resource Centre approached me to ask if I would like to go back with Lead again. There was no question, I jumped at the chance. Since meeting Barbara Taylor , Lead Co-ordinator, I have, under her supervision, got a certificate for refreshing my skills with Access. 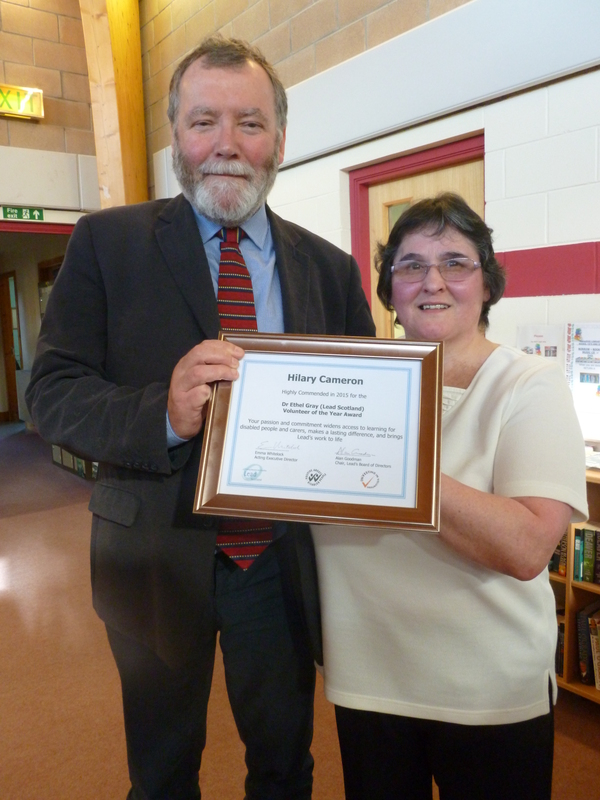 Then I moved on to do the British Computer Society Digital Skills course – again getting a certificate. This was a great time for me; I now had something to do. Through Lead and work I have done with them, I now have become a volunteer with the organisation, which I thoroughly enjoy. I support a learner to improve his literacy skills and computer skills. I have gained a lot of confidence over the past two years, particularly communicating with other people. Through Moray Resource Centre I am also supporting another service user to learn more about how to use the computer and working through the Digital Skills course. My ambition is to develop this side of my work further. I am willing to come into the Moray Resource Centre on another day to support more learners. It is a very special place for disabled people. I am involved with the Speyside Friendship Group and make posters for their coffee mornings. I do the invitations for the Red Cross Christmas party. I surf the web, play games, and keep in touch with my friends through email – but I do not like Facebook! In October last year, I received a Highly Commended Award in the Dr Ethel Gray Volunteer of the Year Awards run by Lead Scotland. The two learners I support nominated me and I was presented with the award by Norman MacAskill who is Lead’s North Regional Development Manager. Anyone who requires a new skill – I would say, go for it – go for it, you have nothing to lose. The more skills you have the better. This keeps the mind active, and healthy. 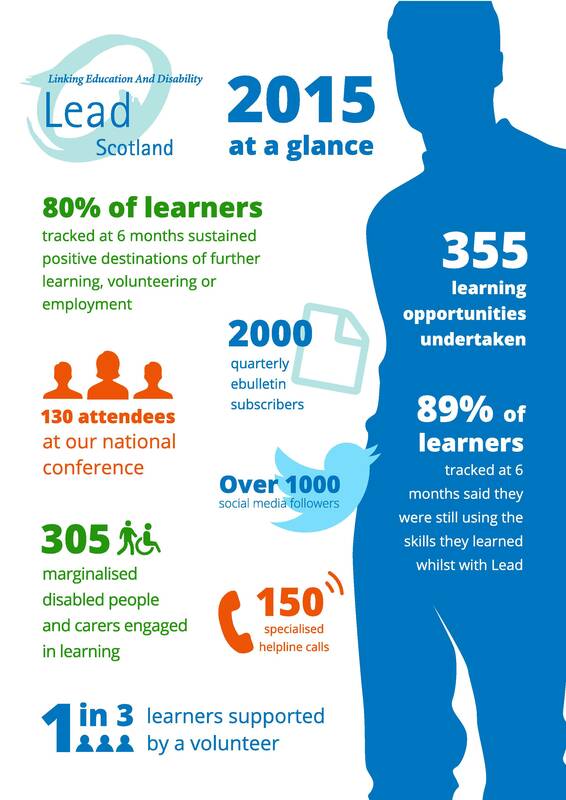 Lead Scotland, Linking Education and Disability, widens access to learning for marginalised disabled young people, adult learners and carers. At a local level, we provide direct support to learners through impartial guidance and support to overcome barriers and plan their learning journeys. We involve volunteer support in our service delivery and offer the loan of digital technologies. Each learner is supported to develop their own action plan and outcomes, resulting in a tailored and unique service from Lead. 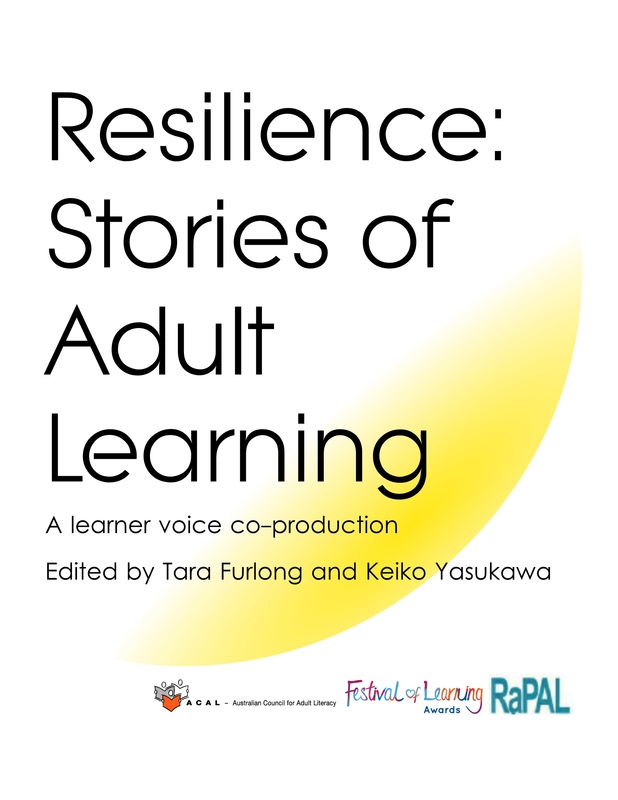 Many learners begin the action planning or the actual learning journey in their own home, as confidence can be one of the initial barriers to their involvement. We also have a national helpline and we influence policy and strategy to promote inclusion at a national level. The Scottish Government’s Statement of Ambition for adult learning provides a favourable policy landscape for lifewide, lifelong and learner centred learning in Scotland, being part of the programme for government. We integrate literacies skills development and digital literacy within our service models which has a good fit with the national Literacies Plan.